As a kid my first knowledge of Glen Close came with Hook; my eldest sister informing me that one of the pirates was in fact actually a women done up in makeup. My initial thoughts were disbelief, amazed at her acting ability, and of course the 'Aw' factor. No wait, I mean 'Ew' factor. Course seeing the actress without the beard was little better. First impressions being what they are, I suppose there could be said to be some bias involved. Except that I grew up, and while I don't particularly care for Glen close, I have liked her in some things. The Sarah Plain and Tall series for instance (come for the Christopher Walken, stay for the heart warming) I thought she was particularly memorable. Course that's TV and I don't count TV when running the numbers. I take all the films an actor or actress has been in and break them down into three categories, 'Good' 'Bad' and 'Okay.' I do not count TV appearances or Made for TV movies. Afterwards a quick analysis will show whether or not they're a good actor by the numbers. Invariably there is a 2-3 +/- point bias on a person to person basis. Also, since 'ok' movies are not bad they count towards the positive column in the overall figuring. If, by the numbers, they fall in the 50 - 60% range, they're a bad actor; 61 - 70% good actor, and 71 - 80% great actor. Anything higher is unlikely, but will be classified as "elite." Honestly I was expecting her to do better. Glen Close has a reputation for pursuing strong characters that are often outside of many an actress's comfort zone. Course that doesn't necessarily translate to quality. Also as I've noted in previous columns I do consider television to be a different kind of acting and so some of the good work she's done there would be counted to her favor should she be rated according to TV credits. Mind you with 62% positive, she does just squeak into the good actress column. And while I expected her to do better, that feels about right to me. She can act, but she's far from being a great actress. One note though is that the rating for The Natural on IMDB I felt was harshly low. What's up with that? It's a good film. This week's pick was chosen by the ever creative Stacey over at Scrap With Stacey. It's been awhile since I did one of these but I feel it's time to get busy rating some actors. Anyone you'd like to see covered? If I haven't already done them I'll put them on the list. 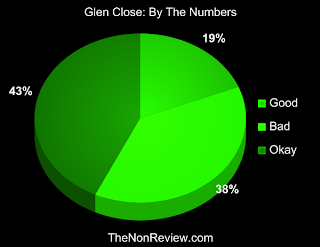 Glen just made the good actress cut! You might say she was "Close" to being a bad actress. You might also say she's "Close" to looking like a man. You might, but I wouldn't. That's just mean. Never been a fan. Sat through Fatal Attraction thinking "Your wife is the beautiful Anne Archer - what on earth are you doing, man?!" 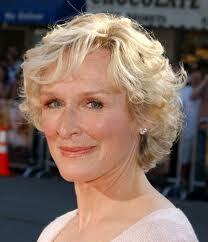 I think my favorite movie with Glenn Close was, "The Paper". She played a bitchy, but interesting character and the movie was so funny. Also loved her in, "Dangerous Liaisons". I'd like you to rate John Cusak, Brad Pitt (my sister says he has never made a bad movie), Billy Crystal, Clint Eastwood or Sean Connery. I'm giving you a list to choose from because I don't know who you have done before. My unfortunate first impression of her was in Mel Gibson's Hamlet, which left me feeling both aw and ew. I would have to echo ALex on this one...the only movie I can remember seeing her in is Fatal Attraction...oh yeah and The Big Chill. Not really a draw for me to watch a flick. Wow! I'm feeling a day late and a dollar short. Sorry to be late to the party but it is the end of school and with 5 kids it gets to be pretty crazy so not much blog hopping for me the last few days. I actually rushed over to tell you that I saw Melvin in a Vitamin Water commerical at the movie theatre yesterday!!! I was there with my kids to watch a film about lacrosse called Crooked Arrow. I was floored to see Melvin! I even shouted out, "hey, it's Melvin!" lol I am sure that people around me thought I was weird. Anyway, I thought I would share. Thanks for the shout out. I didn't know GC was in Hook either. LOVED her in Big Chill. Happy Tuesday! I've never thought that much of her, but I'm still surprised she didn't do better! Holy crap, I didn't know that about hook. How weird. Also, the natural is definitely a great flick.